Documentary which maintains that the real pioneers of space exploration were the Soviet cosmonauts, telling the story of how the Russians led us into the space age. When Neil Armstrong stepped onto the moon in 1969, America went down in popular history as the winner of the space race. However, the real pioneers of space exploration were the Soviet cosmonauts. This remarkable feature-length documentary combines rare and unseen archive footage with interviews with the surviving cosmonauts to tell the fascinating and at times terrifying story of how the Russians led us into the space age. A particular highlight is Alexei Leonov, the man who performed the first spacewalk, explaining how he found himself trapped outside his spacecraft 500 miles above the Earth. Scary stuff. 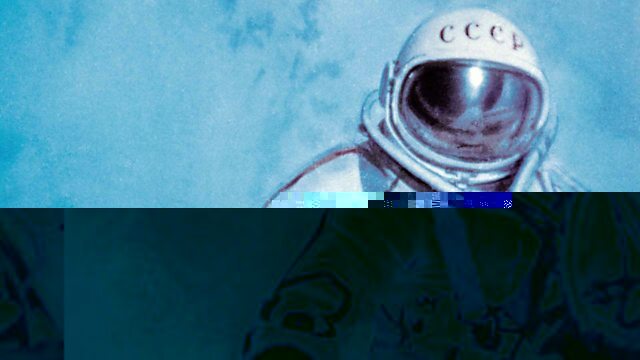 BBC News Magazine's immersive story uses text, images and video to examine how Alexei Leonov, the first person to step into space, nearly didn't return to Earth. On BBC iPlayer only, archive programmes charting America and Russia's attempts to reach for the Moon and beyond. From The Sky at Night, Panorama, Horizon and Tomorrow's World.